In recognition of Veterans Day, we’re proud to shine a light on a very special staff member who has provided nearly two decades of service in the armed forces. Jessica Lewis, OTR/L, co-coordinator of Bacharach’s Stroke Program, assistant director of the OT Department, has served in the United States National Guard for 18 years, achieving the rank of Major. When she was 20 years old, Jessica joined the National Guard in 2000 while attending Seton Hall University. 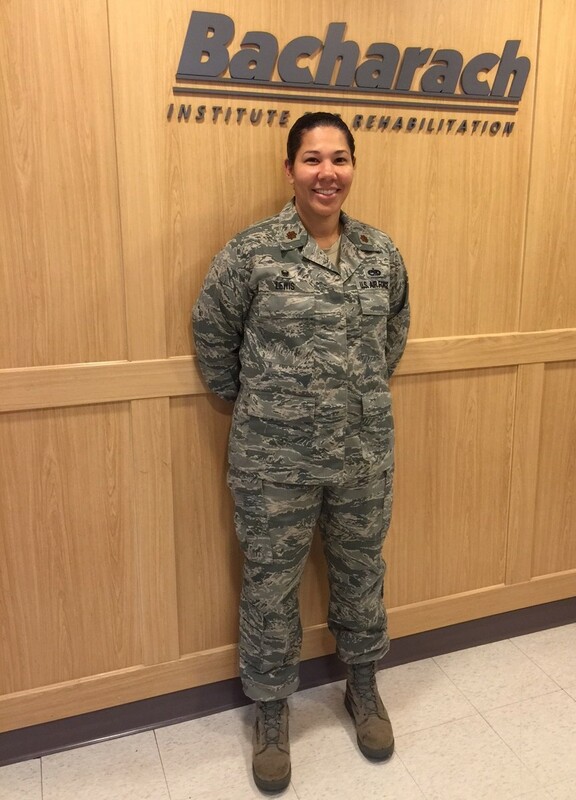 She underwent basic training and continued to serve while she earned a master’s degree in occupational therapy from Richard Stockton College (now Stockton University) in 2005. Jessica has been deployed twice – to active zones in Afghanistan and Qatar. While deployed, she was assigned to manage the flight line, where she oversaw the area where planes were loaded, parked and took off for missions. Jessica currently serves as the Maintenance Operations Flight Commander for the 177th Fighter Wing, where she works behind-the-scenes with the aircrafts to make sure they are safe and mission-capable. “Being in the National Guard has taught me a lot of leadership skills, which I have been able to utilize in my civilian job at Bacharach to help me communicate with different disciplines and lead by example,” says Jessica. Ever since she took a career test in high school, Jessica knew she wanted to be an occupational therapist – she even did volunteer work at Bacharach. Thank you for your service, Major Lewis! We are humbled by your sacrifices and proud to call you colleague and friend.